Martha Wells has recently received a lot of attention for her Murderbot novellas (Doreen’s reviews of the first three are here, here, and here), but she has been publishing fantasy and science fiction novels since the early 1990s, snagging a Nebula nomination for The Death of the Necromancer in 1998. 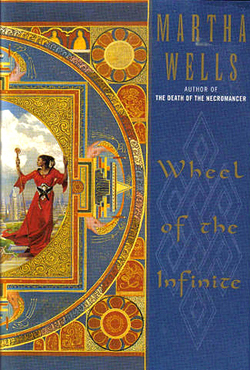 Wheel of the Infinite, her fourth novel, was published in 2000. Maskelle has been called because as the Voices of the Infnite and the lower-ranking religious have worked on the Wheel, a disfigurement has kept developing. Every time they remove it, it reappears. Nobody can understand where the problem is coming from, or what could be causing it. And time until the completion of the Hundred-Year Rite is running short. Wells reveals all of this gradually; at the beginning, readers only know that Maskelle is making her way upriver in rainy tropical jungles, accompanying a troupe of traveling theater people. While out alone looking for herbs to heal a sick child, she fends off a hostile water spirit. Soon after, she rescues a foreigner from river pirates. The foreigner turns out to be a rogue bodyguard who fled his former master when it became clear that he was supposed to be interred as well as part of the former master’s funeral rites. After the rescue the bodyguard, Rian, attaches himself to Maskelle’s group and takes up a similar role, his skills complementing her own formidable abilities and mystical powers. Upon her return to Duvalpore, Maskelle finds that some of her old enemies are still active, and some new ones may have appeared, along with whoever (or whatever) is behind the damage to the Wheel. She is in a race against time to unravel the mystery and to set the world right. Wheel of the Infinite is a solid, enjoyable fantasy tale. Its South Asian–inflected setting was more unusual in the genre in 2000 than it would be now, and it’s an interesting world that Wells has set up. She shows much of the religious aspects through the observations of Rian, who, as an outsider to the Celestial Empire, can’t quite believe that the sand mandala that is the Wheel has an actual effect on reality. Events show him the error of this view; in fact, the religious of Duvalpore would argue that the Wheel and reality are one, that remaking one reworks the other. They cite the case of a strait that was closed and cities cut off from the sea by changes to the Wheel centuries ago, but they say they try not to do that anymore because it leads to unforeseen consequences. There is plenty of action and unexpected reversals as Maskelle and her allies rush to find the cause of the damage to the Wheel, and it comes to a satisfying conclusion. All in all, nifty and enjoyable.